Advanced System 3000, Level 10 includes all the Level 5 features plus a customizable utility language which allows you to create new user-defined features for your own application. Level 10 also supports all machine types in one package. 3D paths are created using 2D contours that slice the part in the Z axis by stepping up or down. Utilities are provided for Surface of Revolution, Swept Surface, Ruled Surface, Cross Section and Top + Cross Section. Automatic gear utilities enable the user to create a gear program by just answering a few questions. Create your own new feature customized to your specifications with a question and answer format as a standard feature. Create a "Family of Parts" using the included 3D utility language. Parametric programming containing hundreds of 2D and 3D math commands, logic statements, decision making commands and character, word and string manipulations to parametrically alter your parts by changing one value. 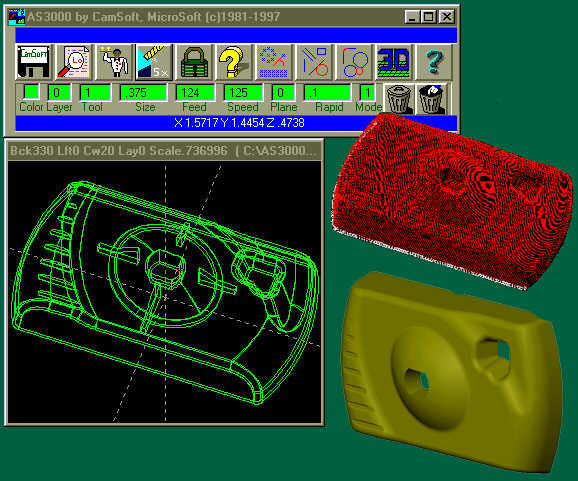 Included Utilities: Family of Parts, Auto Grooving, Clean Out Boxes, Conical Shapes, All Fanuc Lathe Canned Cycles, Helix, Lathe Center Drill & Pecking, 4 Axis Rotary Tables, Spiral Roughing, Thread Cutting, Individually Modify Each Axis, 3D Cross Sections, Create Tabs, Hole Patterns Library, Ruled Surfaces, Multiple Step Down Tool Paths in the Z Axis, Bend or Twist Parts, Harmonic Cams, Constant Velocity Cams, Cylindrical Projections, Flattening a Part, Lathe Part Off Routine, 3D Path Created from a Top and Side View, Surface of Revolution, Wrap a Part in 3D, Create Box with 4 Radii, Ask Depth, Ask to Select a Tool Path with the Mouse, Select a File, Ask Speed, Feed, Tool Number, Tool Size, Rapid Plane, Machining Plane, Retrieve Information from Tool Libraries, Copy a Tool Path while Changing Something in It, Reverse Tool Path Direction, Optimize Tool Path Motions and Hole Patterns, Group the Same Tools Together, Search Geometry Database, Change Geometry, Search Tool Paths, Change Tool Paths. 4 axis Mill and Lathe support. © Copyright CamSoft Corporation. All rights reserved.